That's an odd way to begin a review. But to give BlackBerry's latest handset, the Passport, as thorough a review as possible, I decided to type the entire thing from the phone itself. My twisted idea came from a realization that this (mostly) square oddity is the first phone with a physical keyboard that I've used since the Motorola Droid 4 in 2012 or the BlackBerry Q10 in 2013. It's not even a normal keyboard by modern smartphone standards -- it's a flattened, hybrid setup with both physical and virtual elements and a curiously placed space bar. Needless to say, it's an odd device, one that truly deserves the ultimate test: Can I use it to crank out several thousand words of text? Of course, there's more to the Passport than just its odd shape and the company's desire to resurrect a now-antiquated smartphone feature. I'm going to dive into what sets this phone apart from the hundreds of others already on the market -- that is, if my thumbs hold up through the experience. 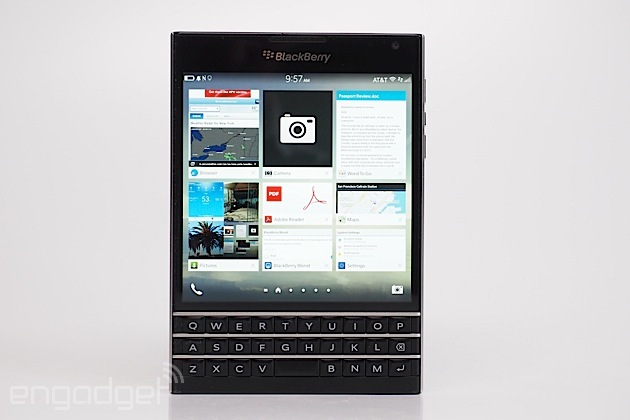 The Passport is the best BlackBerry 10 device you can buy, and comes with a number of flagship-caliber specs. But its odd shape and size, as well as its weird keyboard, may be a turnoff for many. How would you rate the Passport? Whenever I whip out the Passport -- which understandably got its name for having the same dimensions as a real passport -- I hear mutterings of disbelief that a product like this even exists. Saying it's unique is an understatement: The only device that looks remotely similar is the LG Optimus Vu, a nearly square, all-screen phone from 2012. 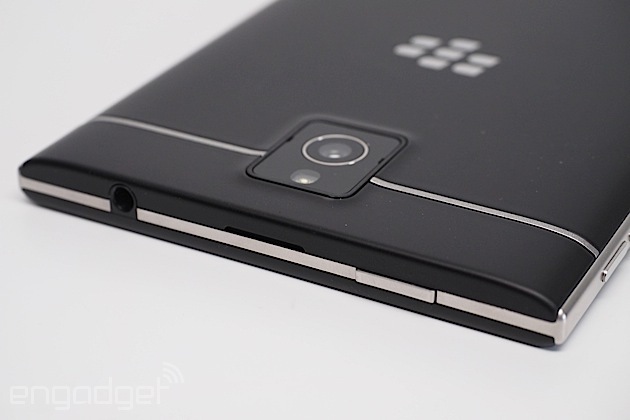 I'll give credit to BlackBerry where it's due: Its bizarre design got people talking. Indeed, buzz is something BlackBerry hasn't enjoyed for a long time. Before the Passport, its most recent handset quietly debuted in February: the Z3, a modest touchscreen device designed for emerging markets like Indonesia. This is the first piece of hardware the phone maker has launched globally in well over a year. 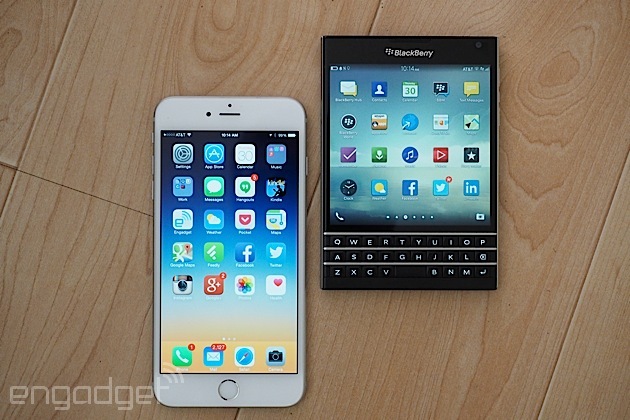 And not only that, but it also has the most competitive specs of any BlackBerry in years. At 128 x 90.3mm, the phone really is as wide as it seems -- it's wider than most large-screened phones on the market -- but BlackBerry insists this is a feature rather than a setback. Because it's using a 4.5-inch square display that's 30 percent wider than an average 5-inch phone, the company claims you'll read up to 60 characters per line and get a better viewing experience. In a way, that's true: I enjoyed reading articles and e-books on the Passport because text didn't have to wrap or get cut off as often, but the trade-off was an awkward one-handed fit and more frequent vertical scrolling. The two-handed typing experience was a little better than I expected it to be. As my thumbs type, my hands naturally cradle the back to prevent the device from slipping out. This is essential because the three-row keyboard sits so low on the device that the center of gravity is different than on most phones, but I never truly felt like I was going to drop it while typing. When I'm not typing, however, I want to be able to use my phone one-handed; sadly, this is incredibly uncomfortable when I'm using the Passport in portrait mode because of its width, and is especially noticeable when you try to hold it up to your ear. I asked a BlackBerry rep how the company expects people to use the device one-handed, and he responded by flipping the phone sideways. As I'll discuss in the next section, the keyboard has a touch-sensitive trackpad that lets you hold the Passport sideways and scroll through websites, emails or Twitter feeds by moving your thumb up or down on the keyboard. It's clever, but there are still clear interruptions in the user experience, which I'll cover in the software section. That said, it's still awkward no matter which way you hold it, because it's short and heavy. Its weight (196g) is reason enough to hold the thing with two hands as often as you can. But at least in return you get a robust build, with solid materials that feel like they can withstand plenty of abuse. It's got a stainless steel frame that lines the 9.3mm sides and also sits in between the keyboard rows; the back uses soft-touch plastic, with the exception of a camera module interrupting a single line of metal near the top. The display is covered with a slab of Gorilla Glass 3. The Passport's screen isn't going to win any medals, but it's got a few pros and cons. Regardless of how you feel about the shape and size of the 4.5-inch square LCD panel, its 1,400 x 1,400 resolution, which equates to a pixel density of 453 ppi, delivers a good viewing experience -- at least in terms of its easy-to-read text and pleasing visuals. But despite having settings to adjust white balance and color saturation, it still appeared much warmer, less saturated and less vibrant than most flagship phones (default or otherwise). White screens look closer to mother of pearl, while the darks are roughly the same grayish-black as most LCDs. Viewing angles are about average for a flagship. The most impressive aspect of the screen, however, is its outdoor visibility. It's one of the best I've ever seen; I had absolutely no problem reading the display in direct sunlight, which can't be said about most devices on the market. In fact, it was noticeably better than the Note 4, which is near the top of the class. The Passport has a 3.5mm headphone jack and power button on the top, with a micro-USB/micro-HDMI port and stereo speakers on the bottom. The left side is bare, but the right features volume up/down buttons separated by a convenience key used for BlackBerry Assistant and media play/pause. The device is adorned with four mics, including one hidden in the phone earpiece. There's a 2MP front-facing camera above the display and to the right of a notification LED and other sensors. Around back, there's a 13-megapixel camera and LED flash, as well as a removable section above the metal separator, which is where you'll find the nano-SIM and microSDXC slots. You'll also get a hefty 3,450mAh battery, but you won't be able to remove it. As I mentioned in the introduction, the Passport keyboard is unlike any other I've tried on a smartphone. This isn't simply a matter of me going back to my roots as a BlackBerry owner years ago and getting reacquainted with the traditional layout used on the Bolds and Curves; I have to learn a brand-new design. I suppose that's part of the fun. This company, despite never-ending layoffs and turmoil, has churned out an impressive feat of engineering. The three-row keyboard doubles as a touch-sensitive trackpad that adds gestures to the typing experience in a very clever way. 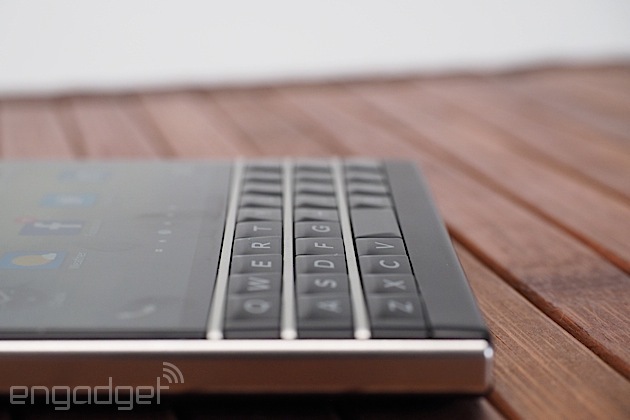 With it, BlackBerry has evolved an old-fashioned keyboard into something fresh and -- dare I say -- innovative. That's not to say it doesn't require a significant learning curve. It's not an easy board to master in a few days, but once you do, you have access to a powerful tool. Just like on most BlackBerrys of old, each key has angled frets to help your fingertips know exactly where to press. It's difficult to get used to the space bar, which is now snuggled between the V and B keys; it's also weird to adjust to the lack of symbol or number keys, since only the backspace and return keys are featured. Where's everything else? In a virtual keyboard at the bottom of the screen, which can change dynamically depending on the app you're using and the type of message you're writing. The default for most scenarios is a row of six symbols, a shift key and number button, but sometimes a number row will pop up above the symbols; when you hit the number button, a full grid of characters appears and takes up over half of the screen. The usual BlackBerry keyboard shortcuts (even the custom ones) haven't gone anywhere; neither has the space bar double-tap to insert a period. However, gestures are the real deal here: You can now double-tap any part of the board to pull up a cursor, which then gives you options for selecting text, copy/paste and so on. Holding the shift button while using the keyboard as a trackpad lets you select multiple lines of text. Swiping left deletes full words at a time. Swiping down pulls up a virtual symbol pad on the screen (which maps each symbol to a hotkey on the physical board). And swiping up toward a word-prediction suggestion automatically inserts that word. Additionally, you can use the trackpad to scroll up and down on apps, websites and other areas. This comes in most handy when you're reading articles or feeds and want to browse everything one-handed; without this feature, one-handed use on such a wide and awkward phone would be more awkward than it already is. 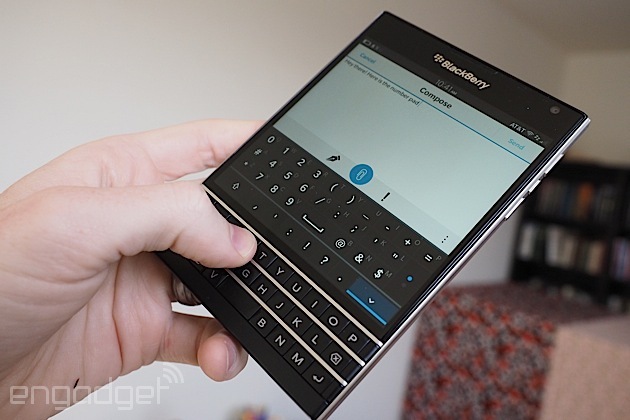 Word predictions are an essential part of today's smartphone keyboards, and BlackBerry does an inconsistent job. For example, as I typed "one-handed" in the last paragraph, it predicted the term early on the first time, but took more keystrokes to figure it out the next two times. Also, after typing my first name in emails, it only predicted my last name half of the time, if that. (The other times, it'd predict "Pitt.") It also had difficulty predicting the end of many well-known metaphors and idioms, like "ducks in a row" or "penny for your thoughts." In fact, I typed out the beginning of 20 of the most popular idioms and it only succeeded at guessing the final word of five of them. The constant transitioning from physical to virtual boards is also confusing and jarring. It's not uncommon for me to type random punctuation marks in the middle of my words because my thumb occasionally hits the virtual keys when I'm actually trying to type letters in the top physical row. It's also frustrating that in most scenarios, I have to do an extra action before getting to type numbers -- either swiping down or hitting the virtual key. And if I need to type a string of multiple numbers in a row, the latter is my only option. Let's get the obvious out of the way: Nobody is moving to BlackBerry for its robust ecosystem of apps. To make up for the fact that developers simply aren't rushing to make BB10 apps, the company has done the best it can to provide enough meaningful programs and content for its users. Now on version 10.3 of its OS, BlackBerry has come a long way from when BB10 debuted a year and a half ago, but it's not far enough to be competitive. Unfortunately, it's instead a hodge-podge of options that confuses most users: two app stores and a method of sideloading Android 4.3 (or lower) apps. In addition to BlackBerry World, the company partnered with Amazon to bring its app store to BB 10.3. While this means users have easy access to more Android apps, it's still restrictive because its catalog has fewer than 300,000 offerings (smaller than the Windows Phone store) and many of the most-used apps aren't there. In addition to the obvious gap in Google services, you'll also find that Netflix, Instagram and Firefox are missing, as well as popular games like Dead Trigger, Asphalt and Beach Buggy Racing (to be fair, Blitz, the older game, is offered). 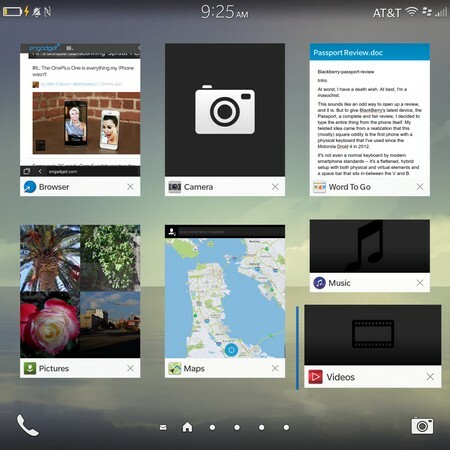 (Update: Dropbox is natively built into Blackberry OS.) It's definitely not a ghost town, especially when compared to BlackBerry World; you can get apps like Facebook Messenger, Vine, Box.net, Zillow and Fruit Ninja, as well as the free app of the day. But it's still a drop in the bucket compared to the Google Play store selection. There are a few third-party alternatives to some of the more popular services, but even those are sparse. That said, you can sideload quite a few Android apps on the Passport (which seems to be appropriate, since the square screen matches the square viewfinder the app uses), but you have to know what you're doing. The process involves converting Android APK files into BlackBerry-friendly BAR files, which you can do using online software or manual run commands. Needless to say, this isn't a novice solution. (Update: You actually don't need to convert into BAR anymore; you can directly download the APK onto the device and install it. I tried this out with Instagram and it worked flawlessly. There's also a third-party app called Snap, which acts as a Google Play client. Thanks @Bla1ze and commenters!) The end result isn't flawless either. The current software only supports Android 4.3; it's an improvement over previous versions of BB 10, which restricted you to Gingerbread apps, but not every Android app will work this way. And even when they do work, they won't offer an identical experience to what you'd enjoy on a device that natively runs Google's OS. Play Services also don't run here, so you're still limited to third-party apps if you use Google Drive or anything else from Mountain View. The exceptions to this are Gmail and Google Calendar, which I had no problem integrating into BB10 features like the Hub. 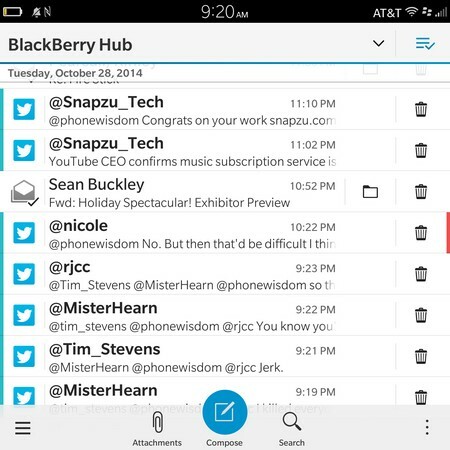 Speaking of, the Hub is BlackBerry's universal message box, and it's one of the best I've ever used. This is part of the company's heritage: Messaging was one of the reasons the company was so successful in its early years. Hub sits prominently to the left of your home screen and houses your social media, email and calendar accounts and organizes it into one handy inbox. So if someone mentions you on Twitter, you can see it right alongside your emails, and can respond to it as if you're in the Twitter app. You can view each account separately if you want as well. The Hub isn't new this time around, but 10.3 adds a few features to make it more useful. Dragging down reveals your upcoming calendar appointments. A right sidebar lets you quickly delete messages. And there's also a new action bar, which is a new way to present the most popular actions for each app and service; the highlighted action is prominently featured in a large blue button in the middle, flanked by two smaller action buttons that stay hidden until you do a subtle swipe to reveal them. Unfortunately, the Action Bar is only available on BlackBerry apps, so you won't get it on third-party experiences. The Action Bar is but one aspect of the new UI design BlackBerry uses in 10.3. 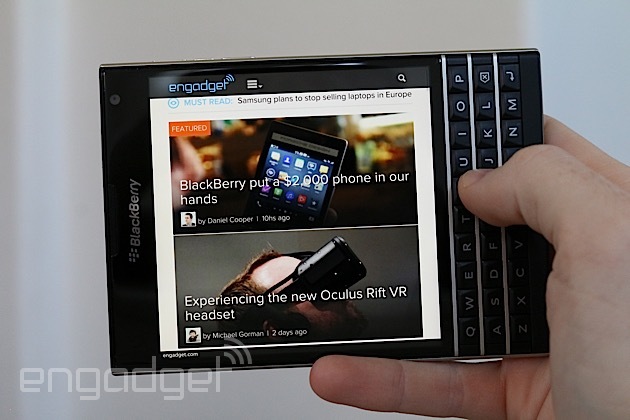 As a whole, the update gives BB10 a flatter, more modern visual style. You'll see this cleaner look almost immediately as you notice the icons in the app grid no longer come with pointless shadows that clutter up precious space. The lock screen comes with a neat new preview mode in which you can see more details about each notification without actually going into the Hub. The home screen, which is where your active apps reside, has been improved. You can fit more frames on the screen and rearrange them in whatever order you want. The active apps actually look a bit like Windows Phone Live Tiles, and when you close one, other apps will get resized to fill the empty space (each tile has a max size and you can fit up to six apps on the screen at that size). If you close all of the apps, the screen will no longer disappear; instead you'll just see a large open screen with phone and camera icons on the bottom corners. 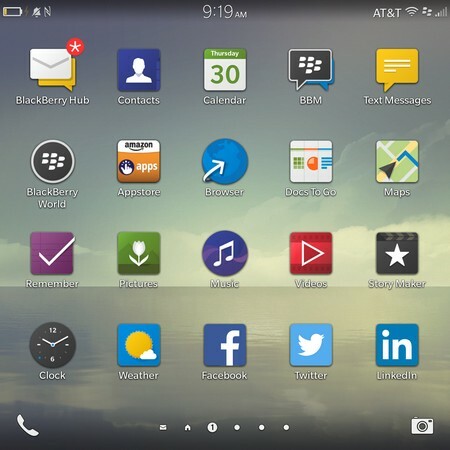 Aside from the now-shadowless app icons, the grid of BlackBerry apps remains largely unchanged. But now you can start typing from here and the new BlackBerry Assistant pops up, giving you access to search through all parts of the phone for whatever you want (think Spotlight) or for specific tasks. Assistant is the new virtual... well, assistant that is powered by Nuance and closely resembles other platform options like Siri and Cortana. It doesn't have quite the same personality as its competitors, but it takes care of nearly all of the same types of tasks. Set alarms and reminders, send messages, create appointments, send tweets, dictate notes, you name it -- you shouldn't have any problems. 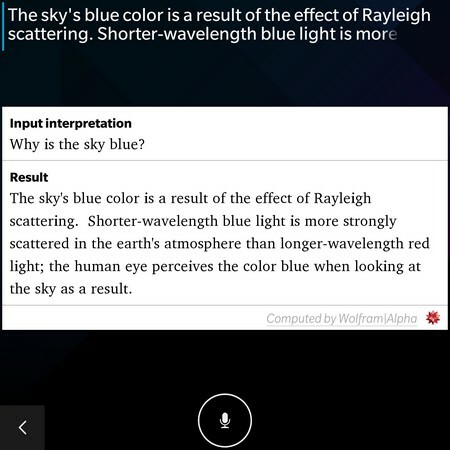 Like Siri, it even utilizes Wolfram Alpha to dive into deeper questions like "why is the sky blue?" Granted, it won't listen to your music, nor will it act like Google Now, where it learns your interests and checks your email and calendar for customized alerts or feeds. But it's a solid start for now. There are a couple new "Advanced Interaction" gestures, such as flipping your phone over to put it in standby mode; and lifting the Passport off a table to light up the screen. 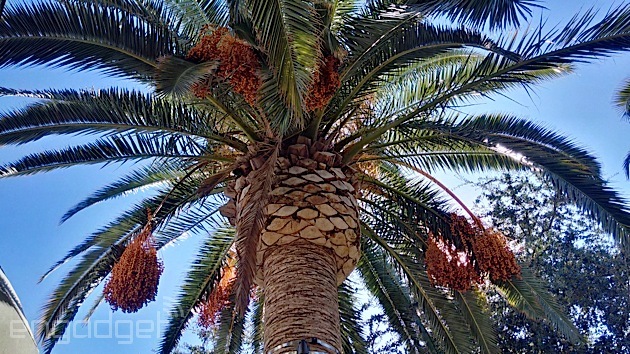 The rest of the usual BB10 gestures are still there, so fortunately you get more options. For additional productivity, you'll also have access to the Microsoft Office-compatible Docs to Go (which I'm using to type and save my review text), and Dropbox and Adobe Reader comes preloaded and lets you edit and even sign your PDF attachments. On the social side, on top of the usual Twitter and Facebook options, Story Maker takes your photos and videos and puts them into a highlight reel, just like what HTC, Sony and third-party iOS apps have done. This came out with BB10 last year, but 10.3 adds some new tricks for your videos. Apple's not the only company pushing for Continuity in its latest firmware update -- BlackBerry has been working on its own version for BB10.3. The service, called Blackberry Blend, is an app that you can download on your MacBook, Windows machine and even on Android and iOS tablets. Once your devices are connected, you'll be able to use them to manage and move files back and forth, send and receive messages (BBM, email and text) remotely, access your contacts and calendar and view movies stored locally on your BlackBerry. Once you put in your BlackBerry ID, the app sets out to connect your devices, and does so promptly. 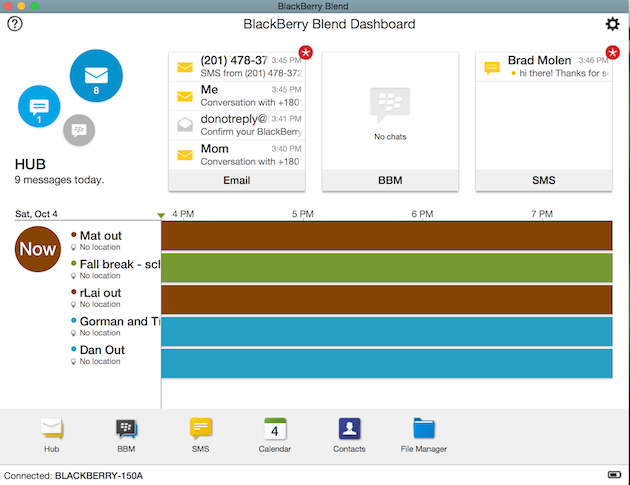 Your first view is the dashboard, which displays your most recent emails, BBM messages and SMS texts on the top, with your calendar below. If you want to take a deeper dive into any of these, or if you're interested in exploring the file manager, you'll find icons on the bottom row to take you to each one. Once you're there, a rail pops up on the left side with tabs to navigate through the app; there's also a home button on the top-left and settings on the top-right. They're large enough on the PC and Mac versions, but cramped and tiny on the tablets. Blend works well, as long as you're in the app. One advantage Apple's version offers is the fact that you can get notifications without having to keep an app open, and you can also make calls from your computer or tablet; not so with Blend. But still, if you're a BlackBerry user who spends a lot of time on other platforms, this will be majorly beneficial. Before we even get into the camera quality, my primary issue with the shooter was its buggy behavior. It often took several seconds to load, and an equivalent amount of time to switch settings and modes. Often, I'd have to exit the app after switching to Time Shift, Burst or Panorama because it would become unresponsive and prevent me from actually taking pictures in those modes. Transitioning to the gallery and back occasionally resulted in crashes. The UI itself is minimal. There are shutter and video-capture buttons on the bottom next to the gallery and a BB10-style settings sidebar that lets you tweak HDR mode, add a timer, switch to other scenes, go into miscellaneous settings and change the aspect ratio from 1:1 to 4:3 or 16:9. If you want to take full advantage of every megapixel, stick with 4:3; 16:9 uses a resolution of 4,160 x 2,340 (it crops out the top and bottom of a 4:3 image) and 1:1 uses 3,118 x 3,118, which means both ratios come out to roughly 9.7MP. You won't find the Passport camera to your liking if you want control over how your photos turn out; manual settings like white balance, shutter speed and ISO aren't available. Aperture's set at f/2.0 and most daylight shots are consistently taken at an ISO of 55 (though shutter speed changes quite a bit depending on the image) to maintain the same amount of noise in each picture. Low-light shots were taken at an ISO of 888. With the UI and settings out of the way, it's time to turn to imaging performance. And to my surprise, it was better than I expected -- in fact, I'd dare say it keeps up with many of the other flagship smartphones on the market. White balance holds up well in daylight shots. Colors aren't quite as saturated as the Note 4, but they're more so than the new Moto X; shots are rarely blown out in sunlight and there's plenty of detail for my liking. 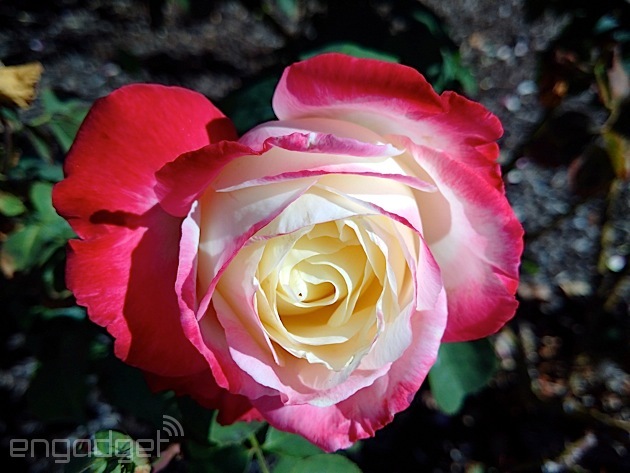 The HDR mode is definitely not subtle, so several of the images came out with a cartoonish look. This works well in some instances -- especially in those cases where there are some extreme highlights and shadows in the same frame -- but just be extra cautious about which mode you choose for which scenario. Low-light performance has potential for greatness. The f/2.0 aperture helps provide plenty of light for my nighttime shots; it actually pulls in more light than the iPhone 6 Plus, though many of the iPhone's images were sharper. There's also a specific Night Mode, which doubles the amount of exposure time in order to bring in even more light, but beware: Focus becomes more difficult, so you get a lot more light but most images will turn out somewhat blurry -- especially in extremely dark scenarios. 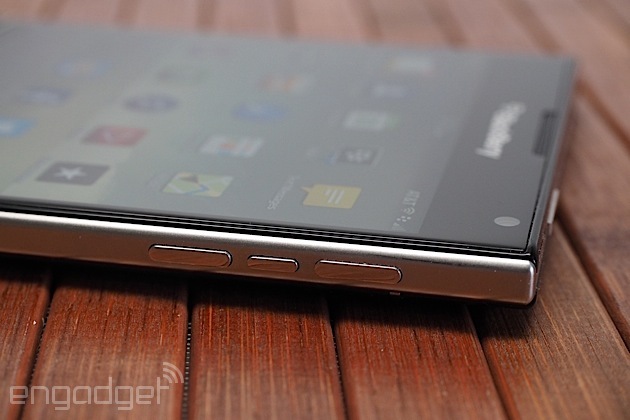 The Passport is unquestionably the most powerful BlackBerry ever made. It boasts a Qualcomm Snapdragon 801 chip, which comes with a 2.2GHz quad-core Krait 400 processor and Adreno 330 GPU. Not only that, but it's also blessed with 3GB of RAM. This puts the Passport in good company, since many 2014 flagships come with nearly identical firepower. It's refreshing to see a BlackBerry device that keeps up with the Joneses, and it's the first time this has happened in several years. In many scenarios, you can see where the copious amount of memory and raw power from the chipset come in handy. Switching between active apps and browser tabs were incredibly swift tasks, with the phone barely skipping a beat. The device's productivity tools cranked through their tasks gracefully: messages in the Hub, Assistant, Blend and so on. Gaming is also mostly a painless experience, but the selection of powerful titles is limited and I relied heavily on puzzle games and free titles that have been on Android for ages (Jetpack Joyride, Fruit Ninja, Angry Birds). I was able to download Beach Buggy Blitz, which worked with few frame skips and was a completely smooth experience, but on the flipside, Minion Rush was nothing but a laggy disaster. Obviously, it seems that mileage will vary here, but overall I was pleased with the general performance of the Passport. However, my generally smooth experience on the Passport was interrupted from time to time. On multiple occasions, the phone froze on me and required a restart. This is definitely not something I've experienced with the same sort of frequency on any device I've used in the last two or three years, let alone a phone that comes with a Snapdragon 801 and 3GB of RAM inside. This bug didn't seem to fit any particular pattern: Sometimes it happened when I was trying to use the camera, while other times I would be hitting a link to open a new website. I've alerted BlackBerry of the issues and the company is looking into it; I'm hopeful that it's simply a software issue that can be ironed out in a future update. On to battery life, which has always been one of BlackBerry's strengths. And with a large 3,450mAh battery to keep your phone alive and kicking, it's still a solid experience. I always had plenty of juice left at the end of the day, and on full days of typing this review on the keyboard and testing the camera, games and other services, I managed to typically have between 20-30 percent remaining. I ran a video loop test, with an HD video playing with some running services in the background, and the device lasted for nine hours and 45 minutes. Of course, I had to use a sideloaded Android app for the test, so it very well could have lasted longer on an app optimized for BB10.3. Regardless, battery life is nothing to worry about. The Passport will be available in 30 countries by the end of the year, and the price will vary in each. In its home country of Canada, it'll cost $699; in the US, you can buy it through BlackBerry's website for $599 (though it's out of stock as of this writing) or Amazon for around $750 if you simply can't wait any longer. The lower price puts it in direct competition with many flagships on all mobile platforms -- most of them, including the iPhone 6, Samsung GS5 and Nexus 6, are about $650. 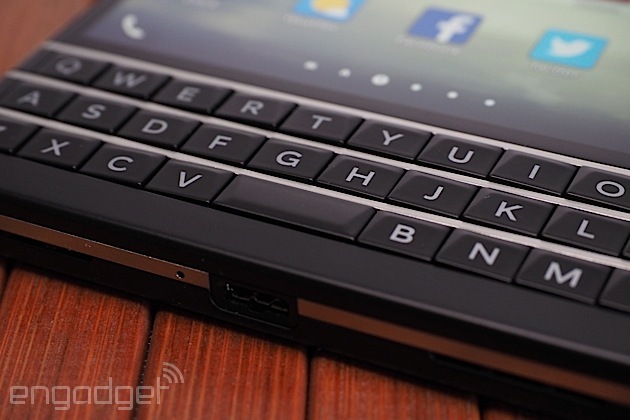 If you want a physical keyboard, the Passport is ultimately your only option right now. There may be some lower-priced devices in emerging markets (the Q10 may still be around in some regions), but this is designed for the high-end business customer. Soon, there will be an alternative -- the BlackBerry Classic, which will come with a keyboard that's much closer to the traditional Curve or Bold design. It won't be as good a performer, but if you need a good keyboard and the Passport's odd design is a little too off the wall for you, your options are extremely limited. The Passport is an odd duck; it's difficult to bestow one final judgment that applies to everyone. It's your only choice if you want a high-end phone with a physical keyboard, and it's the best-performing BlackBerry in the lineup. But it also feels niche, thanks to its peculiar shape and keyboard layout. No doubt, the Passport takes some getting used to. 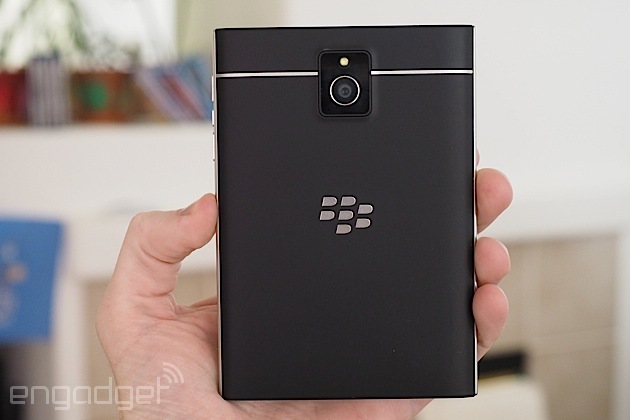 Once you do, however, it's actually a surprisingly good handset -- the best BlackBerry 10 smartphone so far. It's well-built, comes with clever engineering and software services, has good battery life and features a screen that's easy to read outdoors. But the one-handed experience is also incredibly awkward; the keyboard isn't among BlackBerry's best (typing a 4,700-word review on the thing convinced me of that); and the company continues to struggle in its quest for a thriving and more robust ecosystem. (The fact that it has three methods of obtaining apps and still can't get the biggest titles is a testament to that.) For what it is, it's a solid device. But the problem is figuring out whom it's for, and why it matters. My sore thumbs and I haven't found an answer yet.